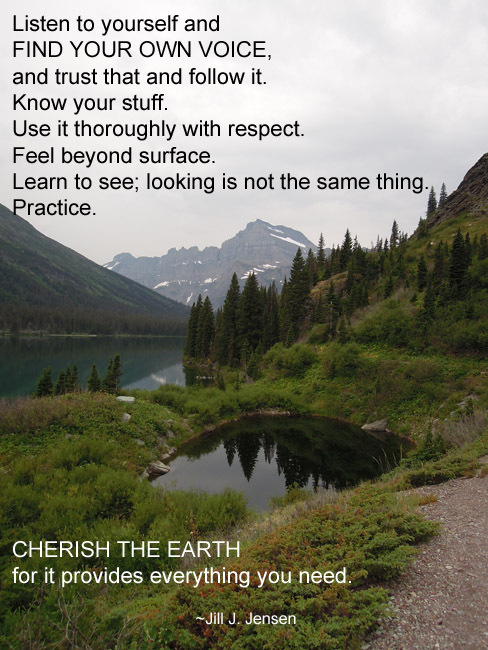 I took this photo this summer in Glacier National Park, but it fit the quote so much (at least the last part), that I wanted to share it on here. The words are from an interview with Iowa photographer Jill J. Jensen. This was an evolution! It began with a scrape or two that didn’t turn out how I wanted. I added some background brush work, then I used a sponge to “print” different colors on. I did a lot of sponge work, actually. Until you have what you see (after adding the lettering). 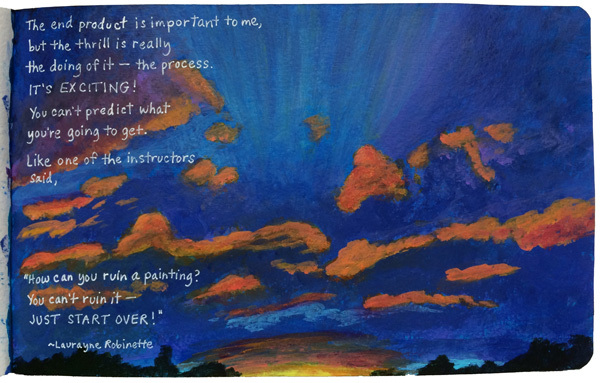 Today’s quote is from artist and UNI art professor Crit Streed, whom I interviewed for both the Iowa Women Artists Oral History Project and the Beyond 9-11 project. Follow the links to learn more about her and her work in these two projects. 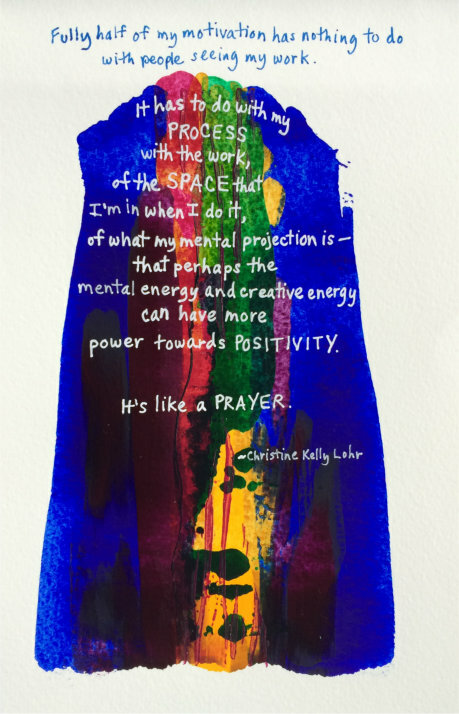 Scraping, brushing, printing—all with acrylic paint. Lettering with gel pen. 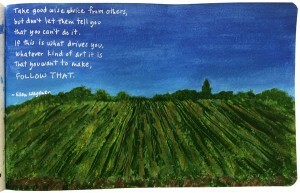 Today’s quote is from my interview with Indianola artist and former Simpson College art professor Janet Hart Heinicke. 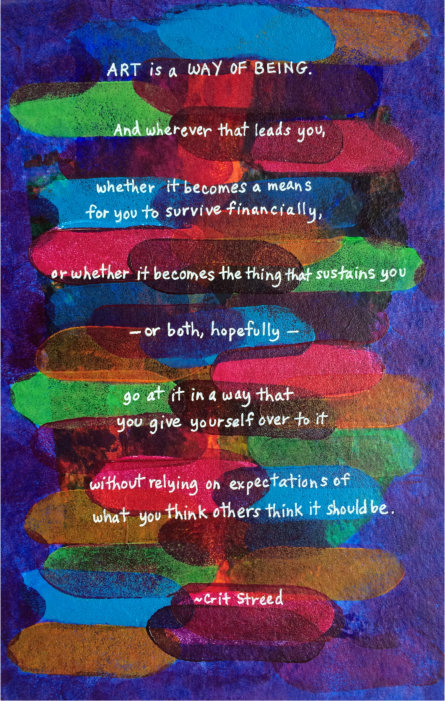 I scraped and block-printed acrylic on this page, then added the lettering. 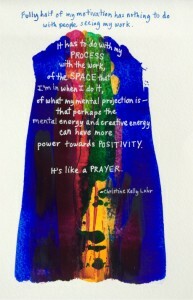 The quote is from my 1999 interview with artist Christine Kelly Lohr in the small town of Churdan, Iowa. This began with a leftover scrape to use up some wet paint. I added the blues and greens with layers of brushwork, and added some deeper magenta over the blob and added more lines of magenta over the blues and greens. 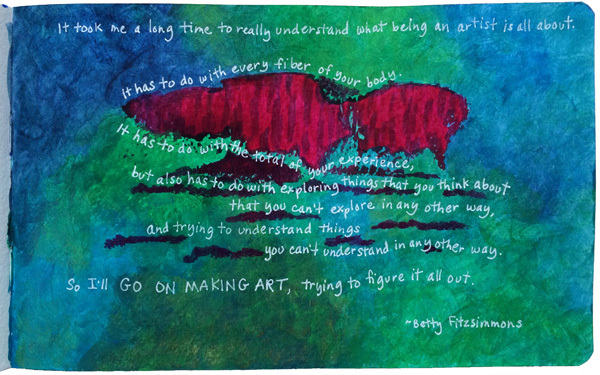 The quote is from my interview with Des Moines artist and teacher Betty Fitzsimmons. 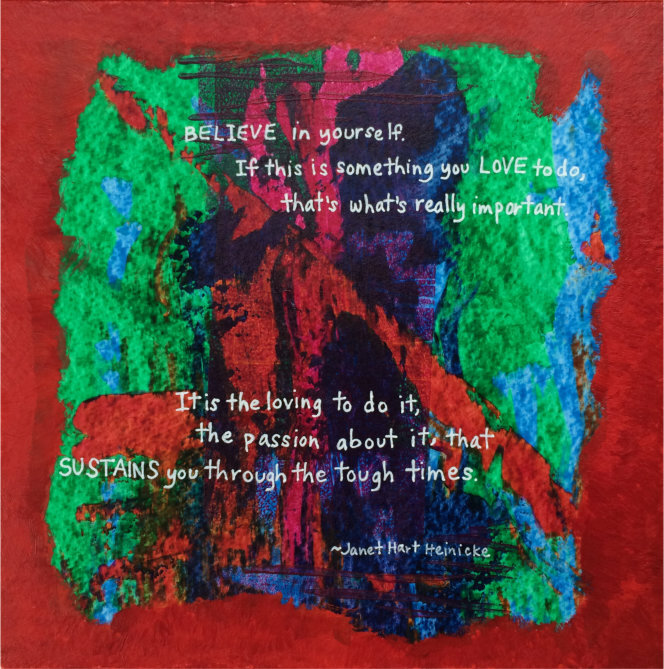 This has acrylic paint scraped, printed, and dabbed onto the paper, as well as various pens and markers accessorizing the painting. Ingrid Lilligren. 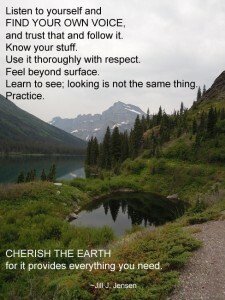 As always, clicking on the image will give you a larger, better resolution image to see and read. This is a photo I took recently of a beautiful leaf. I zoomed in, increased saturation, and then converted it to a infrared black-and-white version. 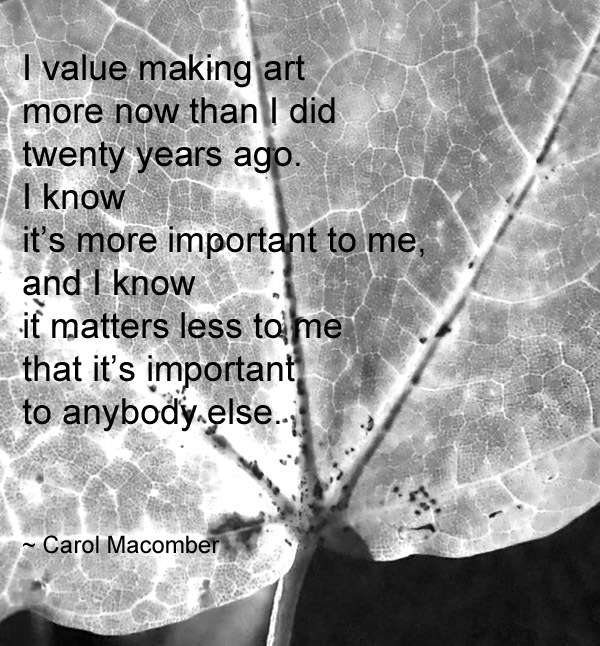 I added the layer of words by Iowa photographic artist Carol Macomber. I scraped some acrylic paint on rather thick, then cut into it with a newly-modified 5-tined hair comb to create the lines. I added some brushed and dabbed acrylic around the scraped area, then after a lot of drying time, lettered the words. 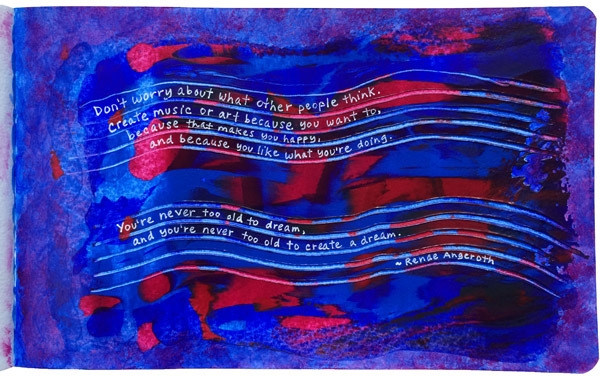 The quote is from my friend and talented composer/musician/knitter/lawyer Renae Angeroth who said this during my interview with her as part of my Beyond 9-11 project (her song was selected by an independent judge for inclusion). (She also composed a new musical theatre piece, Palace of the Fields, that had its first public reading in late August of this year.) 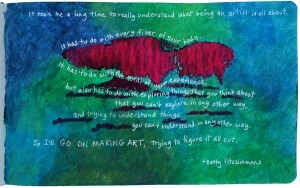 In addition to creating beautiful music and knitted projects herself, she is a great supporter of her artist friends. I scraped, brushed, and palette-knifed acrylic paint to create this piece. 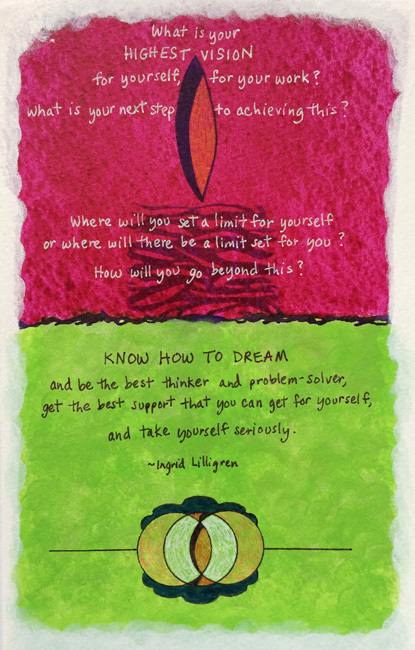 The quote is from an interview with artist Ellen Wagener. We talked in DeWitt, Iowa, where she lived at the time. Ellen now lives in Arizona. 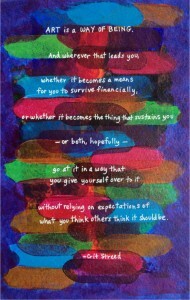 This is brushed on acrylic paint and lettering with marker. 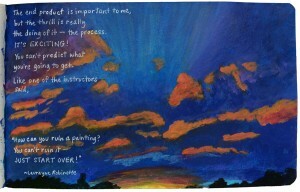 I had a few moments during the painting process of wanting to take the advice of “starting over” with this one. But…here it is. 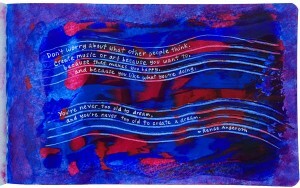 Today’s words of wisdom are from Urbandale artist, Laurayne Robinette—who also happens to be my mom! She has modeled resilience and persistence (and beauty!) 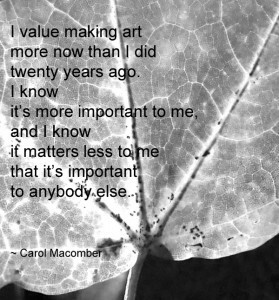 in her artwork as well as her life. How lucky am I?